I graduated from the University of Arizona in May of 1966. By the fall of 1966 I was a beginning teacher at Pueblo High School in Tucson. I had managed to grab what was then considered a plum job with Tucson District Number One. In those years, due to overcrowding, Pueblo was on double sessions, so in September of 1966 when I was 22, I was thrown into a 6 AM class full of seniors who were all only a few years younger than I.
Let’s just say it was a challenge. It was the old days. I wore heels and hose and dresses to school every day. I wore size eleven shoes at the time. There was only one store in town that carried size elevens, and those was all narrow width. My feet have always been medium. So I ended up with a gorgeous pair of black and white spectators, but by the end of school each day, I was in agony. That’s my biggest memory of that first year—that my feet hurt every day. It seemed to me that I never managed those senior kids all that well, and so, for my second year, I asked to be moved to the afternoon session where I ended up teaching sophomores. I was more experienced by then and felt that I had better control of the classroom. We did a recreational reading program that was a huge success. Years later, one of those sophomore kids—the one who had given me the most grief—told my husband that I was the best teacher he ever had. But all these years, I’ve considered what I offered those older kids in my first year of teaching was less than stellar. So this week, I received an e-mail from a woman named Cindy whose late mother, Roberta, had been one of my students. Cindy said, in part, that her mother had come to one of my signings years ago and had a book signed. Cindy added, “She loved your stories and she was also very proud to let people know that she had you as a teacher at Pueblo.” Cindy finished by saying that when she’s reading my books, she feels as though her mother is looking down on her and smiling. That comment was enough to make me go all warm and fuzzy. Knowing that reading my stories can elicit that kind of connection to a missing loved one is a comment to cherish, and I do. When the e-mail came in, it was too precious not to share, so I read it aloud to my husband. The thing is, I taught at Pueblo for two years, and I didn’t know which of those years Roberta had been one of my students. A few minutes later, however, Cindy sent a followup e-mail. 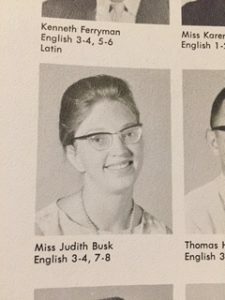 It contained a photo taken from her mother’s high school year book of a faculty member, “Miss Judy Ann Busk.” My goodness! Looking at that photo I was struck by how very, very young I was back then. Since I married during that first year of teaching, I was Mrs. Judy Janc when I taught in the afternoon session. Roberta had been one of those hard-to-crack seniors. And she remembered me. Despite my misgivings, I had been a teacher she looked up to and valued. What a gift that was, coming at me out of the blue, all these years later. Then something else struck me. In that yearbook photo, I noticed that way back then, I wore my hair the same way I wear it now—pulled back on my head and fastened into a French twist with combs. Some things never change. So I’m sitting here humming a few bars from the theme song of that BBC series, New Tricks. It’s all right. It’s okay. Getting to the end of the day. But today, I’m taking Cindy’s gift with me. I taught in an inner city high school in Houston, Texas, for 16 years. Recently had a mini-reunion with some students from 30 to 40 years ago, and it was great. We really never know how we touch students unless they tell us. I wouldn’t change that experience for anything! You have been an inspiration to me. At 69, I’m in the process of writing my first mystery-set here in Carmel IN. Better late than never. Not aiming to write the Great American novel, a best seller, or even to get published for that matter. I just want to prove to myself that I can do it. My mother-in-law, now 92, suggested I read your books. I read one in 2012, Judgement Call, enjoyed it, but at the time, for whatever reason, it didn’t “click”. Two and 1/2 years later I read Old Blue Line. It clicked. From March until June of 2015 I read all remaining 48 of your books in a row and have been hooked ever since! Now, as soon as you publish a new book, I read it immediately on publication. I have an order in for The A-List. I had the pleasure of seeing you speak at the TFOB last March, where you signed my copy of Duel to the Death, which I read immediately. I read Field of Bones this past September. Hope to see you again at this year’s TFOB as well. I can now safely say you are my favorite author-and frankly you are up against some stiff competition: Penny, French, Perry, Hamilton, RWWhite, Box, Fairstein, etc. That you are still writing two books a year at 74 is an inspiration! Keep ‘em coming! I’m all teary-eyed reading of how you’ve touched people in so many of your walks through life and how they’re able to relive and reconnect as a result of your persona writing. Such treasures. Was your hair red then? I think it’s great to see the way you looked then. I looked very glum in my high school photos as wore braces and didn’t smile. I look like a matron at a women’s prison. I’m glad you heard from this former student and learned that you did make a difference. I admire anyone that teaches high school english. I taught high school for 4 years and was glad to get my elementary certificate. The last year I taught I was told I would be at the high school the next year. No way, I retired. I‘m re-reading Desert Claw for the 4th (?) time. Hard to believe it has been about 20 years since you wrote it. Thank you for sharing! I love your blogs and I look forward to reading them every Friday morning! You never know what impression you leave with someone! You are a Blessing to many!! I always enjoy your blogs/emails so much. They really get to the “HEART” of the matter. I was an occupational health Nurse Practitioner. When I finally get that Police Officer to pay attention to his diabetes, when I am able to talk to a staff member who is not used to talking to medical practitioners (and hadn’t been taking a much needed medication ordered by her Primary Care MD) and I was able to explain the issue so she could understand, etc. These are the things that make our “job” so worthwhile. Thank you for reminding me. Oh, my gosh…what a wonderful feeling that must be. How awesome that Cindy reached out to you. Have a great weekend. I was taking chemistry in 1961 as a junior. My teacher, Mr. Larson told us we were going to hate him, but someday thank him. He then proceeded to teach us how to REALLY use a slide rule. Every day we had a quiz of 5 questions using the slide rule to figure out the answers. In 1969 I was taking college level chemistry at ASU, and since it was second nature to use one, I skated through the semester easily. I sent him a letter of thanks . Now I keep a K & E slide rule in my curio cabinet and show my grandchildren the calculator I had in high school. It’s right next to an abacus to which I attached an electric cord . We all have teachers we remember from our years in school. I had several who were outstanding and I learned a lot, thanks to them. And, after almost 60 years, I still have all four year books that I treasure. I watched New Tricks on our local PBS station in Spokane, WA. It was great fun and I loved the song. Great story!! Interesting you say that about so little age difference between you and students. After getting out of USMC in 1969 I tried to go to college but the fact that I was close to same age as teachers and older than other students wasn’t a good mix with the anti-war sentiments. It didn’t work!! Thanks for sharing your wonderful stories. Loren, did you ever try college again? I had two semesters before I quit to work and then marry. Twenty years later I was able to get into a program for older students and was able to finish. I really wanted that BA behind my name. A lot of my work was writing papers, but I attended some classes because I needed to see the slides for art history. The regular students were cautious around me as they thought I was a faculty wife spying. Try to take some classes if it is still important to you. I feel we are personal friends in some ways. Every book I read, I gain something of value, a life value, if you will. Quite possibly, its your personality coming thru those pages. We are near the same age…I am retired…and you could be too. I am so selfish…I hope you never do! Thank you for all you do for we readers. You are wonderful, and important in my everyday life. I so look forward to these Friday posts…in addition to the books. I love reading the comments and knowing that my little once-a-week pieces are appreciated. Thanks to all who have written. I have read every Joanna Brady book written and I just finished reading the new book Field of Bones. The book was great and I was pleasantly surprised to discover the recipie for the meat loaf in story. Yes the meat loaf was as wonderful as the book. Thank you. It is funny that we never realize how much we have effected people in the moment but later in life we come to find that we have touched a lot of hearts. I love hearing true stories like this. It warms my heart. I to work in education for about three years in, yes, Bisbee Arizona. I am in Southern San Diego county now and run into the kids who say they remember I was the one who didnt let them get away with anything. Here I thought they just liked to chalange me all the time. I love all you personal stories and your books. Just remember…I know where where all the bodies were buried in the Joanne Brady book and where the wearhouse is in San Diego in Ali books….love love love your books. Every book I read, I gain something of value, a life value, if you will. Quite possibly, its your personality coming thru those pages.I am retired…and you could be too. I am so selfish…I hope you never do! Thank you for all you do for we readers. You are wonderful, and important in my everyday life. I so look forward to these Friday posts…in addition to the books. My wife, Kathy, was a first grade teacher for 19 years in a small town. We constantly meet her former students, now adults with kids of their own, and they all remember her well. She has a cup and a refrigerator magnet with the slogan “To teach is to touch lives forever” and I firmly believe that. The theme song is “End of the Line” by the Traveling Wilburys.